All I know is that more and more gardeners in our neighbourhood have started to cultivate these narrow bits of land – and that I approve. This option doesn’t exist on our street, sad to say. However, I appreciate the efforts on other streets, roads and avenues. These images were taken last spring, a couple of weeks later in the season. I love the way you can get a really close look at the plants in these situations, without that feeling of trespass. 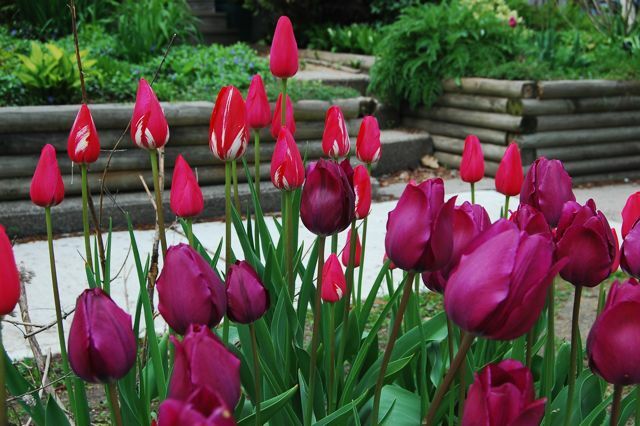 Tulips, particularly, have surprising insides that warrant closer inspection. 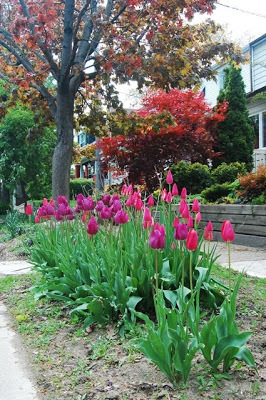 Think I’ll swing by soon to see what else has been established here to fill in the space as the tulips ripen – always the challenge when planting tulips: what to do to disguise the necessary yellowing foliage. Will these gardens still have curb appeal? I’ve heard them called “hellstrips” or “boulevard gardens”. Hi Helen, in the US we call them hellstrips. Maybe curbside gardens would be more appropriate for those you have shown. Thanks for the info, folks. If I don’t have a hell strip, does that mean I live in gardening heaven? Hmmmm. This is an exceptionally good idea in drier areas. (Replace thirsty turf with xeric plants.) Looks pretty too. Thanks for sharing. 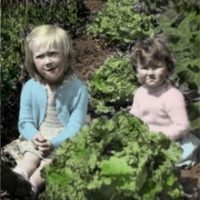 Wow, Frances, you’ve got some stunning photos on your blog. Love those Salvias, what a great combination. And that collection of Bohemian Waxwings lounging around the pool is To Die For!!! Sarah — Hell Strips: Hellarious! Hubby thinks they are called boulevards, just like those islands between the lanes of the street. I think they are lovely when planted. Somehow, it feels like it was done for the pleasure of the passersby and I do appreciate it.